Figure 1 - The Andromeda Galaxy, M31. The dwarf elliptical galaxy M32 is just above and to the left of the bright core of M31. The dwarf elliptical M110 is below and to the left of the core of M31. Credit: Adam Evans/Wikipedia. 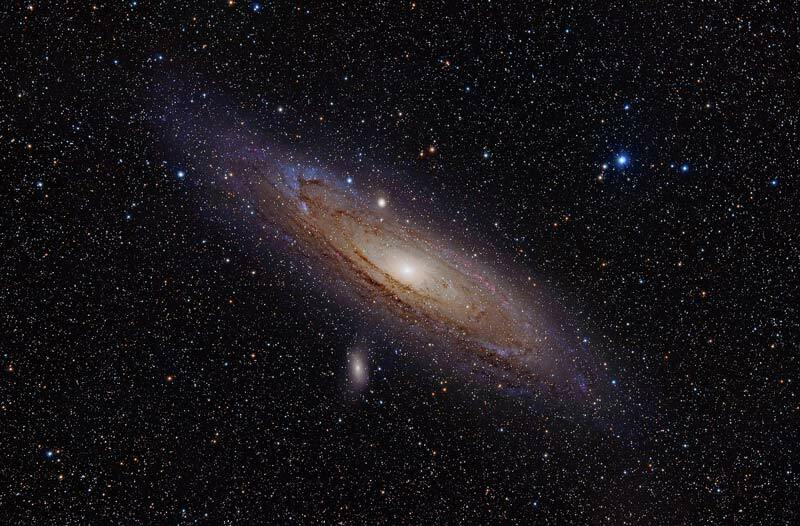 The mighty Andromeda Galaxy, M31, is the brightest and most accessible spiral galaxy in the night sky. It's visible to the unaided eye even from suburbia, and it offers observers with a telescope the opportunity to see a major spiral galaxy close up. In a 3-inch or larger telescope, in dark sky, the galaxy reveals dust lanes in its spiral arms which themselves extend an astonishing five full degrees from edge to edge. A small scope also reveals two small companion galaxies to Andromeda, the dwarf ellipticals M32 and M110. The Andromeda Galaxyalso has in its gravitational embracetwo otherdwarf elliptical galaxies, objects far fewer stargazers bother looking for (or even know about). These two small satellite galaxies, cataloged as NGC 185 and NGC 147, present a rewarding challenge to observers with a small telescope and clear dark sky. Let's have a look at these lesser known companions to M31. 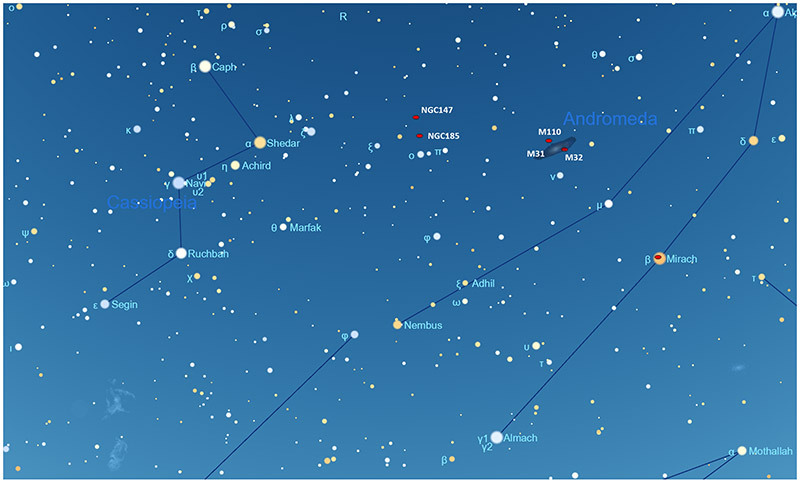 Figure 2 - The location of NGC 147 and NGC 185, dwarf companion galaxies to the Andromeda Galaxy, M31. Image created with SkyX by Software Bisque. Both NGC 185 and NGC 147 lie about 7 degrees north of M31 in Cassiopeia, a constellation better known for rich star fields and many fine open star clusters. Like M31 and its better-known companions, each of these dwarf galaxies lie about 2 million light years away, about the same distance as M31 itself. The galaxies likely revolve around each other as a binary system, and the pair itself revolves around the much larger M31. Each is about 1/10 the diameter of its parent galaxy. And each is about the same size and shape as Andromeda's more famous companions. To find the pair, look south of the "W" of Cassiopeia, from the bright star alpha (α) to the chain of lambda (λ), zeta (ζ), xi (ξ), then to 5th-magnitude omicron (ο). NGC 185 is just a degree west of omicron, and NGC 147 a degree west of that.They both fit into the same low-power field of view. At magnitude 9.2, NGC 185 is the brighter of the two. It appears nearly round and slightly concentrated near the core, somewhat like an unresolved globular cluster. It's about 17' (arc minutes) across, roughly half the size of the full moon.There are also two bright foreground stars to the west and east of the galaxy. While big professional scopes can resolve the individual stars in this dwarf elliptical, you won't be able to see individual stars visually with a backyard scope. NGC 147 is just a degree to the west-northwest of NGC 185, and, at magnitude 9.5, a more challenging sight. It is clearly elongated compared to NGC 185, though its long axis is about the same as the diameter of NGC 185. The galaxy is a little fainter and far more elusive. The rich star field in which it's embedded also makes it hard to find. Figure 3 - Images taken with an astronomy video camera of NGC 147 (left) and NGC 185. Credit: Brian Ventrudo. When you get each galaxy in your sights, inspect them at a range of magnification to get the best view. Higher magnification tends to darken the background sky, but also render the galaxies somewhat fainter. These galaxies emit broadband starlight, which means light-pollution or nebula filters do little to nothing to improve the view. Amazingly, some sharp-eyed observers have seen these two small galaxies with 7x50 binoculars in dark sky. But a 3-inch or larger telescope makes them easier to find. Clear, dark sky is essential. A little haze or light pollution will render them all but invisible. NGC 147 and NGC 185 are also cataloged, respectively, as Caldwell 17 and Caldwell 18. Along with M31, M32, M110, and our own Milky Way galaxy, NGC 147 and NGC 185 are part of the Local Group of galaxies. The Milky Way and Andromeda, along with the Triangulum Galaxy, M33, are by far the largest members of the Local Group. The entire assembly spans a diameter of about 10 million light years and contains about 54 galaxies in total, most of them quite small and dim.